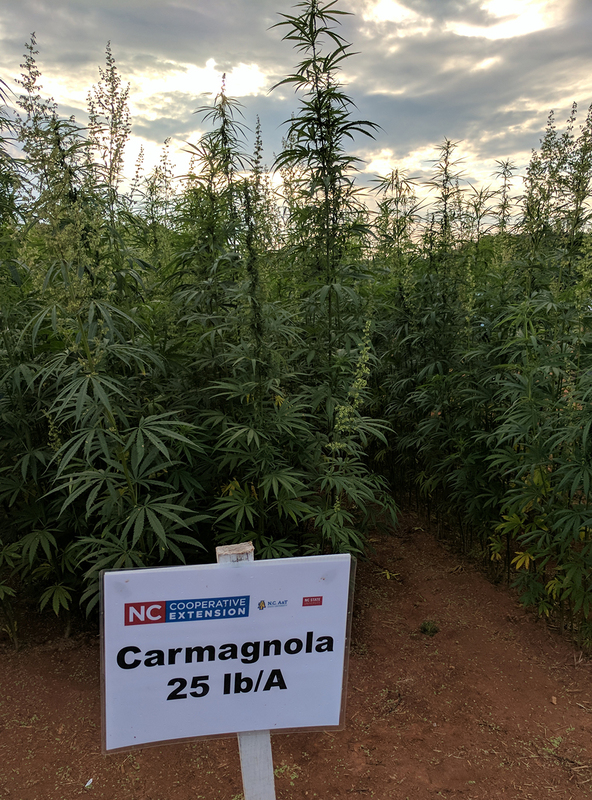 Industrial Hemp Is North Carolina’s Newest Crop! Industrial hemp. Photo by Debbie Roos. There’s a lot of excitement about a new crop for North Carolina that is just now being harvested: industrial hemp! Industrial hemp has been grown around the world for hundreds of years. Hemp is a valuable agricultural commodity in over 30 countries where its stalk, seed, and flowers are processed into multiple products including food, beverages, fiber, textiles, paper, construction and insulation materials, cosmetic products, and animal feed. Hemp plant. Photo by Debbie Roos. Industrial hemp is the same species as marijuana (Cannabis sativa) but the two crops are distinguishable by their tetrahydrocannabinol (THC) content. THC is a cannabinoid produced by the plant that causes the high from marijuana. Hemp must have less than 0.3% THC. 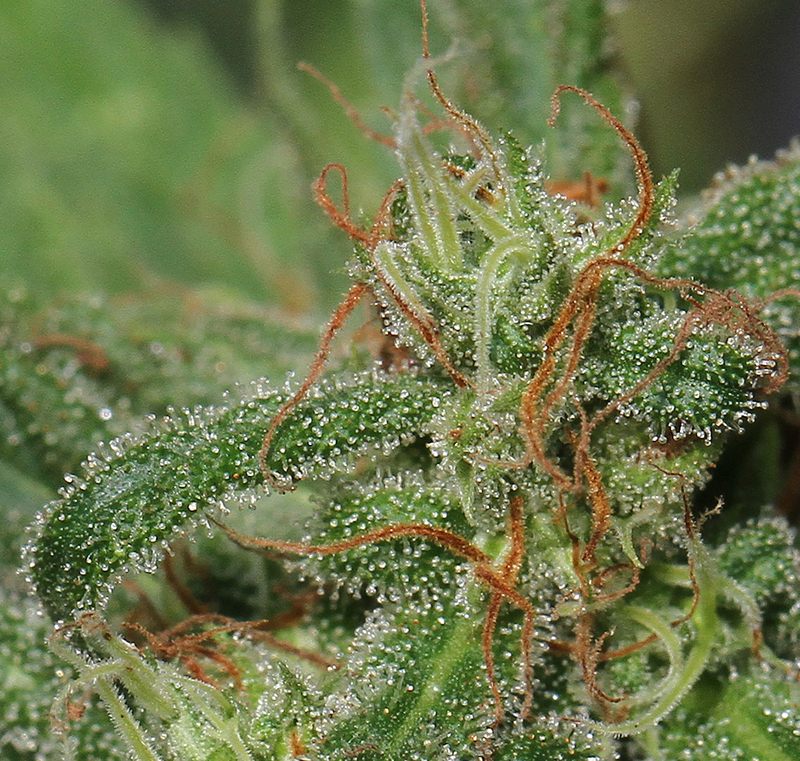 Plants that have more than 0.3% THC content are classified as marijuana. 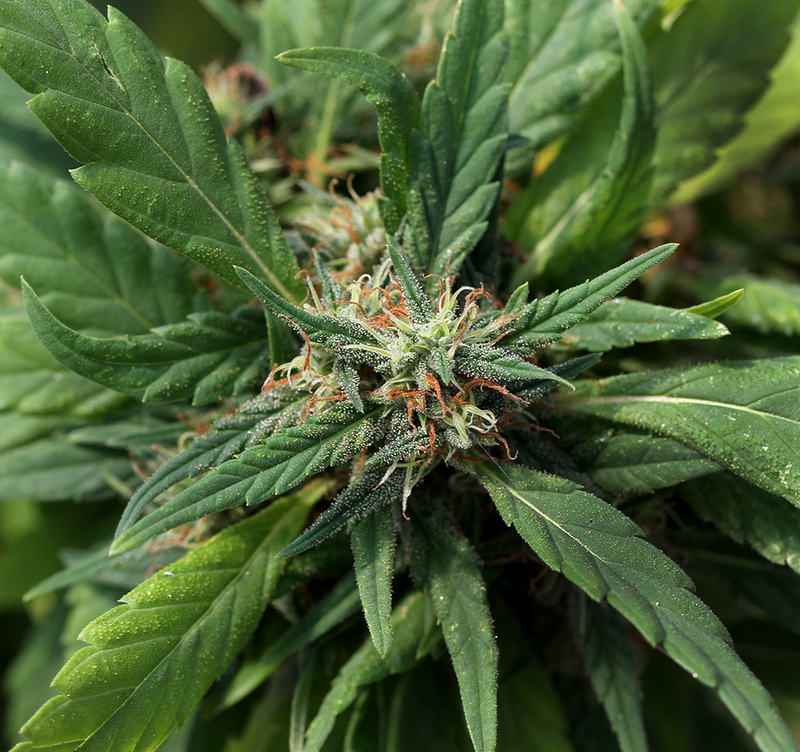 Cannabis plants produce many other cannabinoids besides THC. Cannabidiol, or CBD, is a cannabinoid that has attracted a lot of attention for its pharmaceutical effects and is used to treat epilepsy, depression, pain, and other ailments. Many hemp growers are interested in the high-value CBD production. Demand for hemp products is high in the U.S. but until recently hemp production has been very limited due to federal drug enforcement laws. According to the National Conference of State Legislatures, 38 states and Puerto Rico considered legislation related to industrial hemp in 2017. Some bills clarified existing laws and some established new licensing requirements and programs; 31 states now allow industrial hemp production for commercial, research, or pilot programs. Industrial hemp production was legalized in North Carolina in 2016 as part of the Pilot Research Program. 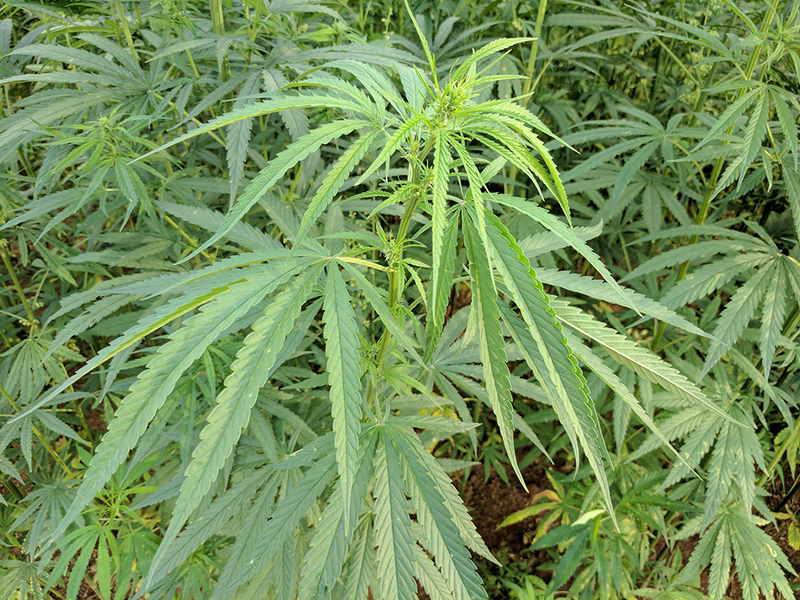 A North Carolina Industrial Hemp Commission was formed and North Carolina State University, North Carolina A&T State University, and the North Carolina Department of Agriculture & Consumer Services are all participants in the pilot program. All growers in the pilot program are required to conduct research to further the understanding of hemp production, harvesting, processing, and marketing in North Carolina. Research areas include variety selection, seed production, fertility, insect and disease management, weed management, greenhouse production, market feasibility, value-added production, oilseed production, energy production, and more. Industrial hemp can be grown as an agronomic crop or more intensively as a horticultural crop, depending on what it is being grown for (fiber, seed, CBD oil, etc.). 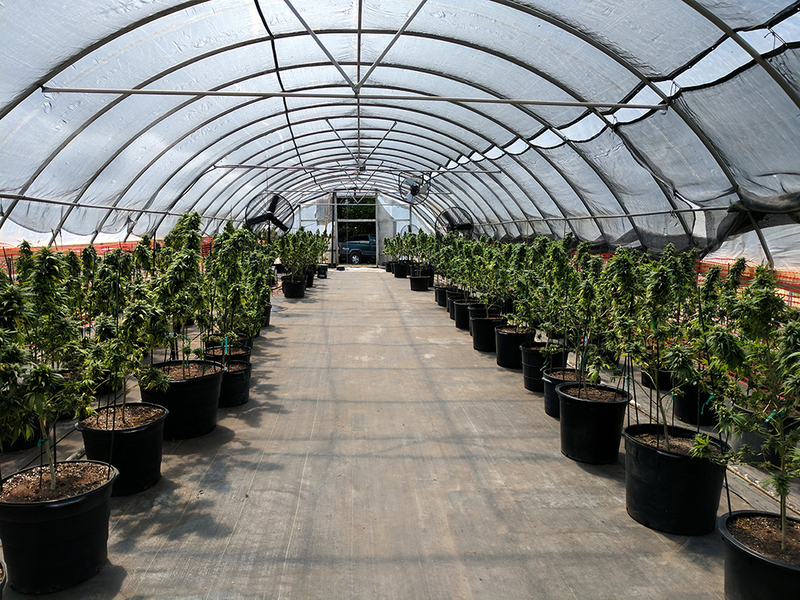 Some growers in North Carolina are growing industrial hemp in greenhouses and high tunnels for medicinal CBD oil production. 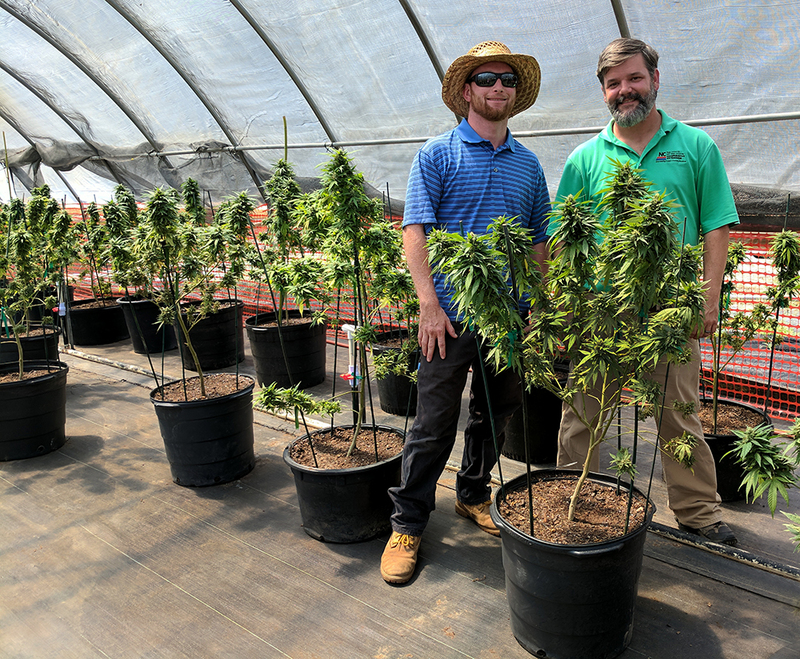 Guilford County Agriculture Agent John Ivey is well positioned to help these growers because he has experience working with a legal cannabis crop. “I’m excited that our farmers have chosen to be early adopters and taken ownership of the research that hopefully will improve their farms’ production and sustainability,” Ivey said. Since I have no experience with hemp (like most agents in the state! ), I asked Ivey if I could tag along with him to visit one of his growers to learn about high tunnel hemp production. We visited DSW Farms in Greensboro where grower Sager West is growing hemp in pots in a high tunnel using organic practices. Industrial hemp grown in a high tunnel for CBD production at DSW Farms. Photo by Debbie Roos. Grower Sager West (left) and Guilford County Agriculture Agent John Ivey. West grows hemp in the high tunnel for CBD production. This first year of production has been challenging because the transplants were already flowering when he received them. Consequently, yields are expected to be lower than normal this first year. Photo by Debbie Roos. 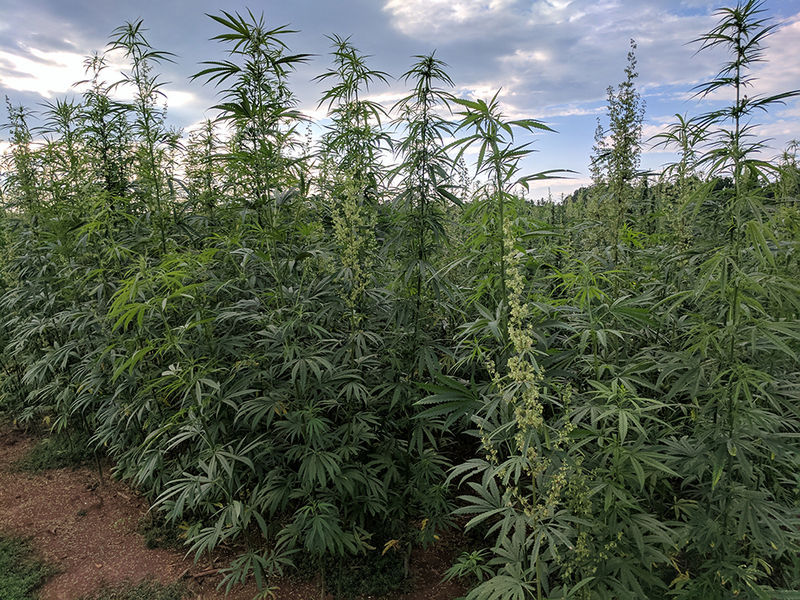 West is growing hemp for CBD production. CBD is primarily found in sticky, crystal-like hairs called trichomes on the buds and surrounding leaves and bracts of female flowers. He will harvest and cure the flowers then send them to a processor to have the CBD oil extracted from the trichomes. Female hemp flower. Most (but not all) hemp cultivars are dioecious, meaning male and female flowers are found on separate plants. Hemp growers interested in CBD production want female plants. Photo by Debbie Roos. Close-up of the sticky trichomes that contain the CBD oil on the female flowers. Towards the end of flowering the pistils turn reddish-brown. Photo by Debbie Roos. High tunnel hemp pests include spider mites, aphids, and caterpillars. Beneficial insects can help with pest control. This photo shows a tiny parasitic Ichneumonid wasp pupa the size of a grain of rice next to a dead caterpillar that was eaten by the wasp larva. Photo by Debbie Roos. West said that this first year of production has been a big learning curve for everyone. Growers got a late start in planting due to the application process so it was not a typical production year. He is already looking forward to applying what he learned to next year when he plans on growing hemp both in the tunnel and the field. “I’ve been passionate about hemp and its potential to help farmers for over ten years and so the legalization of hemp production in North Carolina has been a blessing and a dream come true for me,” West said. “I’m eagerly looking forward to helping to shape a new sustainable industry for North Carolina. 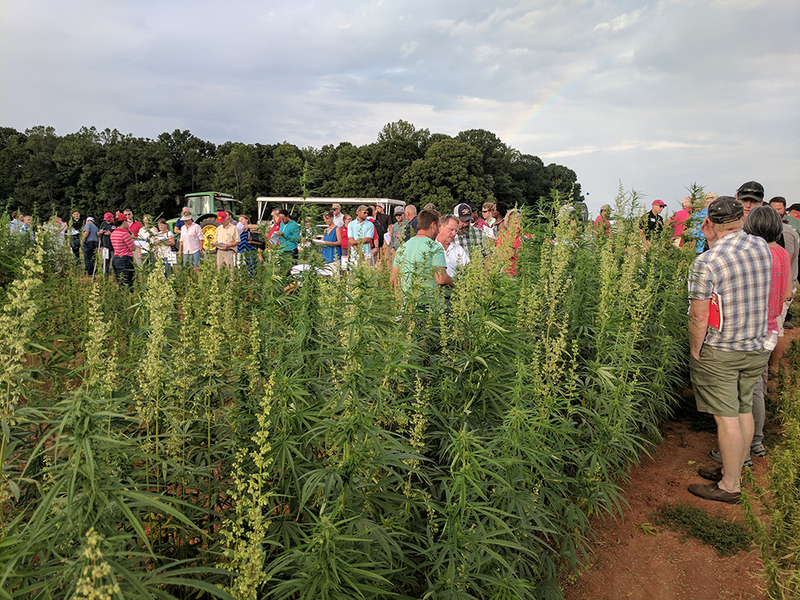 Because all North Carolina hemp growers are on a steep learning curve this year, opportunities to network and learn from other growers and researchers are highly prized. 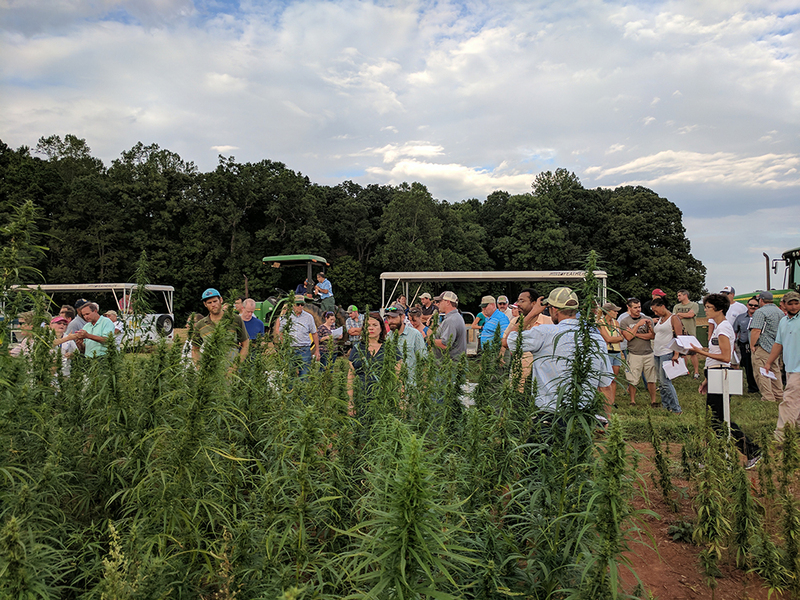 About 80 growers, extension agents, and researchers attended an Industrial Hemp Field Day conducted by NC Cooperative Extension at the Piedmont Research Station in Salisbury on August 16. The field day was an opportunity to network and get an update on the research being conducted at the station. Several varieties were planted at the research station in mid-June. This is about a month later than the ideal planting season but since this is the first year the crop has been planted in the state everything is a little behind. Several varieties and seeding rates were compared at the research station. 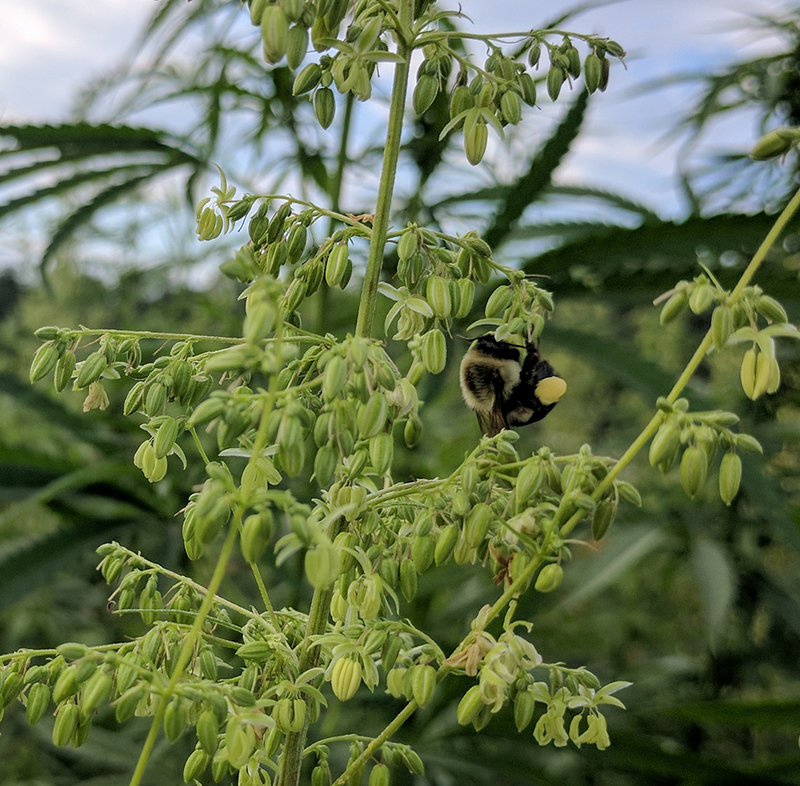 The bumble bees were all over the male hemp flowers. Honey bees will also visit hemp which is primarily wind pollinated. Beekeepers in other parts of the country where hemp is grown have found a good market for hemp honey. Bumble bee foraging on a male hemp flower. Photo by Debbie Roos. Our researchers are busy learning about hemp pests, diseases, and weeds. Pests include caterpillars (corn earworm pictured below), Japanese beetles, grasshoppers, leafminers, spider mites, aphids, and more. There are currently no pesticides labeled for use on hemp in the U.S. Researchers are trying to determine which products work on hemp so they can apply for specialty labels. There is also interest in organic hemp production. 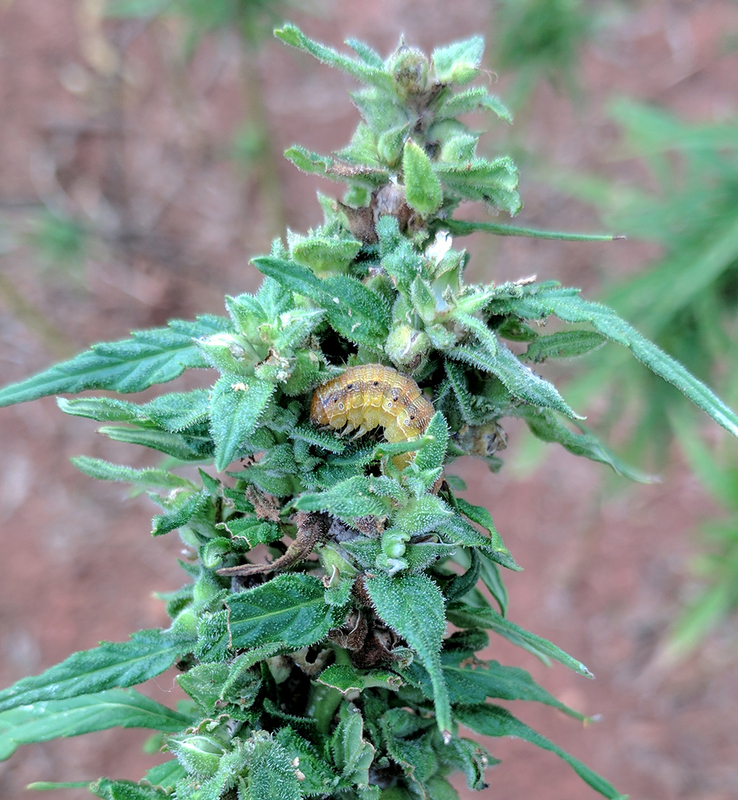 Corn earworm on hemp. Photo by Debbie Roos. The field day provided many opportunities for networking among participants. I learned a lot talking with others and made plans to visit some growers in other counties. We are all trying to learn from each other! 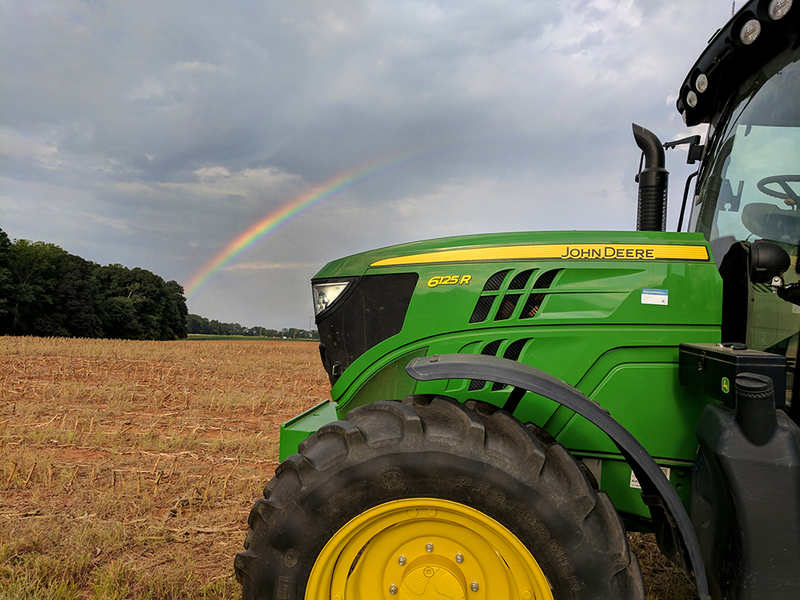 A lovely rainbow greeted us in the field across from the hemp plots! To grow industrial hemp, farmers are required by law to obtain a license to participate in the industrial hemp pilot program. Growers can submit an application for a license to the Industrial Hemp Commission, which is responsible for developing rules and applications for participating in the program and reviewing and approving applications.